Take to the sky with these Batman Logo Knee High Shiny Cape Socks! Designed from the Bat's classic suit, these knee high socks feature Batman's gray and black motif, logo, and even his shiny, black cape! 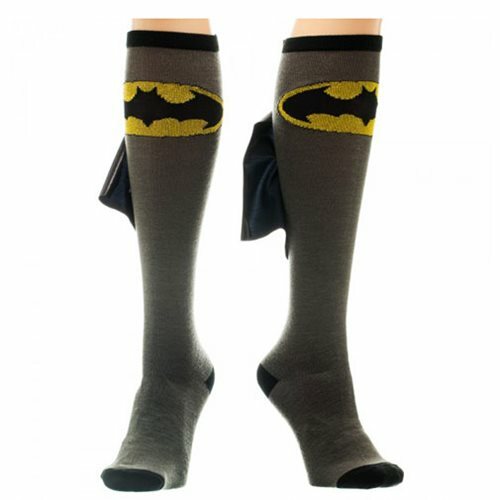 Show off your love for Batman with these Batman Logo Knee High Shiny Cape Socks. One size fits most women's shoe Size 5-10. Made from 68% Acrylic, 98% Poly, and 2% Spandex. Sock size 9-11 Ages 14 and up.